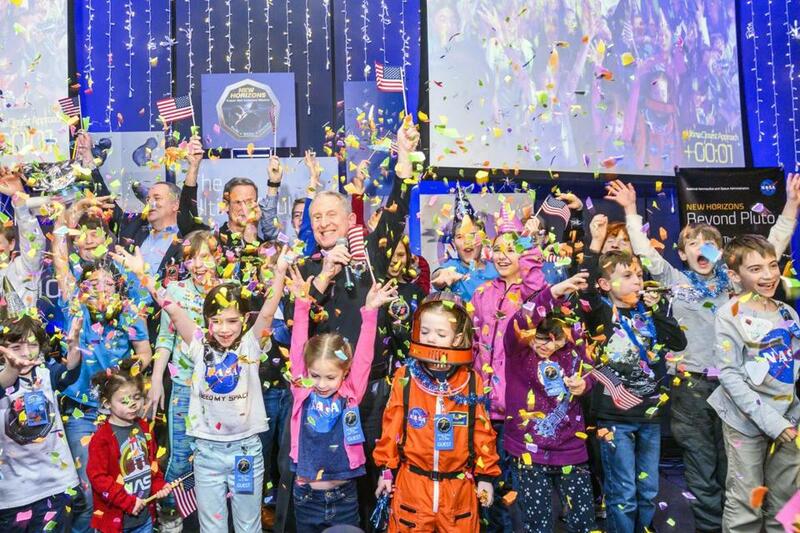 S. Alan Stern, center, New Horizons’ principal investigator, was surrounded by children at Johns Hopkins University Applied Physics Laboratory in Laurel, Md., shortly after midnight Tuesday, celebrating the moment the NASA spacecraft New Horizons encountered Ultima Thule, an object orbiting a billion miles beyond Pluto. LAUREL, Md. — Thirty-three minutes after midnight, scientists, engineers, and well-wishers here at the Johns Hopkins Applied Physics Laboratory celebrated the moment that NASA’s New Horizons spacecraft made its closest approach to a small, icy world nicknamed Ultima Thule. Almost 10 hours later, the New Horizons team finally received confirmation that the spacecraft had indeed done everything they had asked. In the days and months to come, the mission’s scientists expect to receive pictures of Ultima Thule and scientific data that could lead to discoveries about the origins of the sun and the planets. That is the latest triumph in a journey that started in 2006, first on a mission to explore Pluto. Thirteen years and more than 4 billion miles later, New Horizons has provided humanity’s first glimpse of a distant fragment that could be unchanged from the solar system’s earliest days. During the flyby, the spacecraft was out of communication with Earth because it was busy making scientific observations. Only hours later did New Horizons turn its antenna toward home. Then, it sent a 15-minute update on its status, confirming it had survived the flyby. The message took six hours to travel the 4.1 billion miles at the speed of light to Earth. Future transmissions are expected to convey new pictures and readings from the flyby. At 10:31 a.m., the mission operations center at Johns Hopkins, which runs the mission for NASA, confirmed that a radio dish in Madrid, part of NASA’s Deep Space Network, had locked in to the signal from New Horizons. Clapping and cheering erupted in the room where the mood had been quiet and nervous a few minutes earlier. “I don’t know about you, but I’m really liking this 2019 thing so far,” S. Alan Stern, the mission’s principal investigator, said at the start of a news conference on Tuesday. The scientists revealed new images of Ultima Thule, taken before the flyby when the spacecraft was still a half-million miles away. Ultima Thule looked like a fuzzy bowling pin or a peanut, roughly 22 miles tall and 9 miles wide. The images also solved a mystery: why Ultima Thule’s brightness appeared unchanging as the spacecraft approached. Typically, a spinning, irregularly shaped object would rhythmically brighten and dim as it spins. The few fuzzy images so far sent home have not yet cleared up how long it takes for the small world to complete a single revolution. Another question that has not yet been answered is whether Ultima Thule could actually be two small worlds in tight orbit around each other. Stern and Weaver said it was more likely that Ultima was a single object. The spacecraft has started sending back flyby images for scientists to study later on Tuesday. “By tomorrow and the next day, Ultima Thule is going to be a completely different world from what we’re seeing now,” Weaver said. The scientists will begin to start counting craters, mapping the surface, looking for moons and rings around Ultima Thule and identifying materials on the surface. By doing so, they hope to gain a better understanding of the thousands of small worlds in the Kuiper belt, a region beyond Neptune strewn with icy debris. Because the spacecraft is far away, it will take 20 months for all the data to trickle back. The highest-resolution images taken at closest approach are not scheduled to be sent to Earth until February. The scientists will continue to pore over incoming data this week, but then take a pause when the sun is in between Earth and the spacecraft, blocking communications. They will meet up again in mid-January. Bowman said this flyby was different from the spacecraft’s Pluto encounter 3.5 years ago, where the closest approach occurred during the morning and the spacecraft called home in the evening — all in a single day’s work. This time, they celebrated and went home and came back to work in the morning, still not knowing for sure whether the celebration was warranted. “I was probably a little bit more nervous this time,” she said.